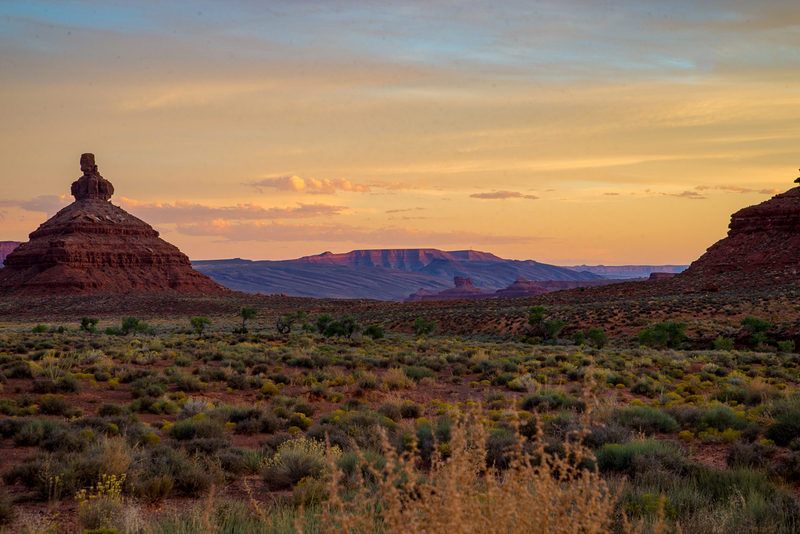 After another sunrise shoot at Monument Valley, we traveled north to Utah. 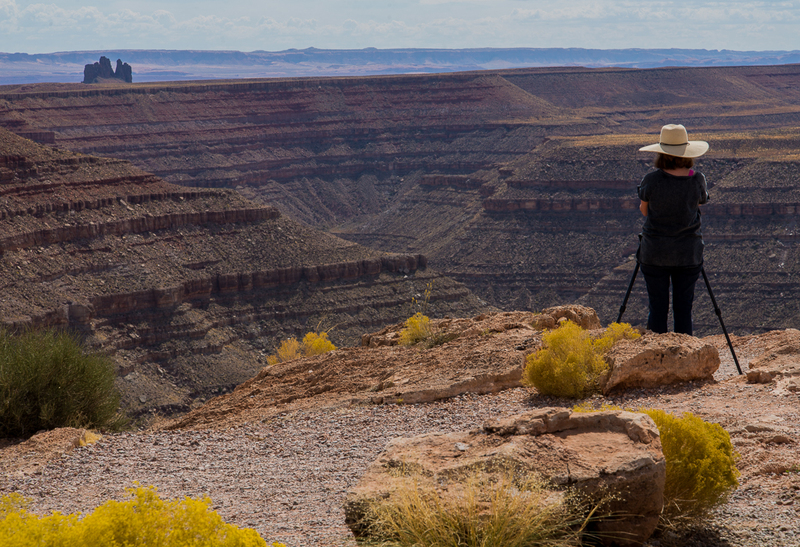 It was mid-day by the time we arrived at Goosenecks State Reserve – the light was kind of flat, but you get the idea. The horizon line was a challenge, but I think this is correct. 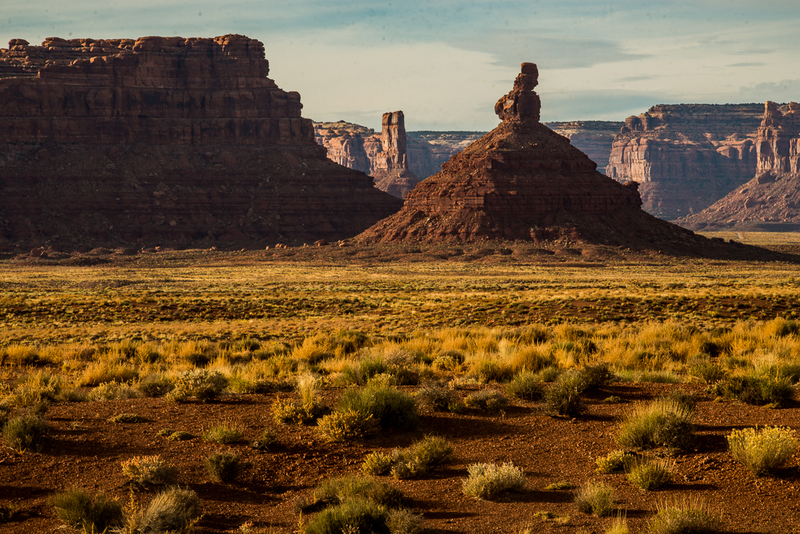 The reason for the sloped horizon line of the Goosenecks may be that millions of years ago, this part of the Colorado plateau was lifted, leaving the river at the bottom to carve away the sandstone. The ridge in the background is straight though! The drop to the San Juan River is about 1000′ and the ledge offered one trail down that was not for the faint of heart; it looked like it only went to the next ledge down, not all the way to the bottom. 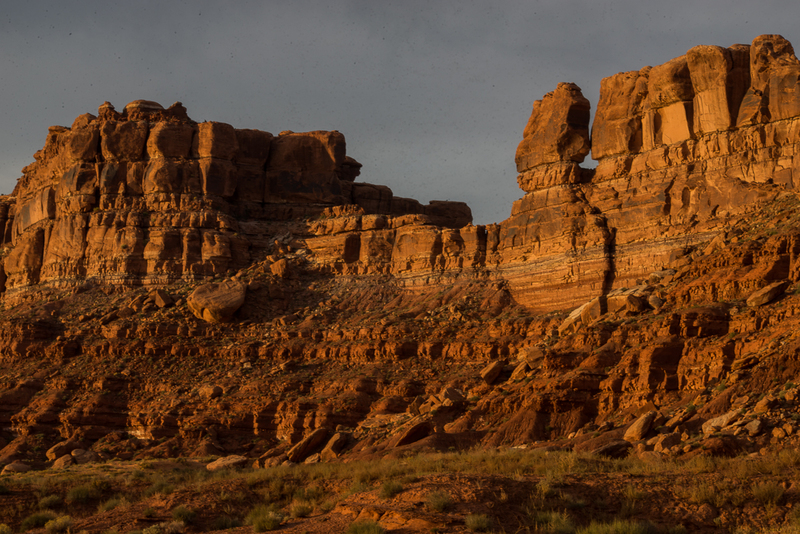 Now you see why it’s called Goosenecks. I stood on that ledge too, to get the panorama below (would have been better if I braved the downward trail to the tip of the next ledge). 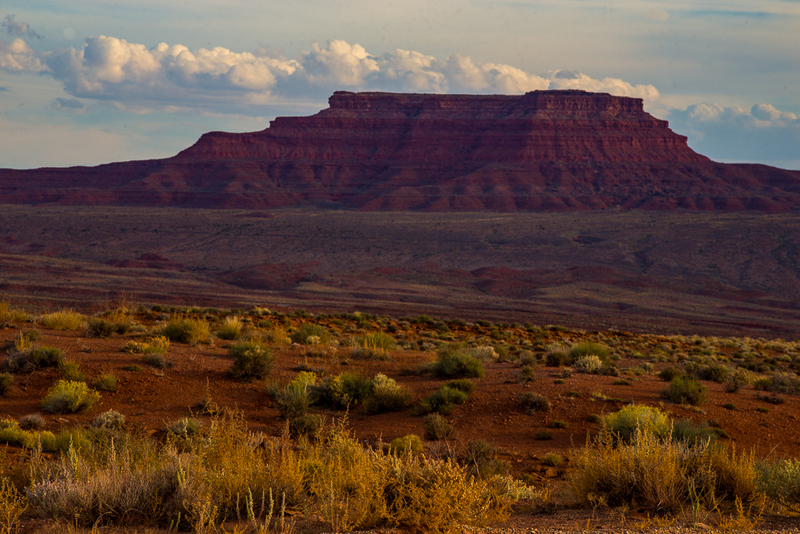 After Goosenecks, we checked into our campground. This allowed me time to fix the flat tire that I had to have changed in Monument Valley. The poor AAA people had to travel 1.5 hours to get to me, gotta love AAA. Later that afternoon, part of our group traveled to the Valley of the Gods. This was another of those days when sweat drips from your eyebrows, nose and chin. Gosh it was hot. 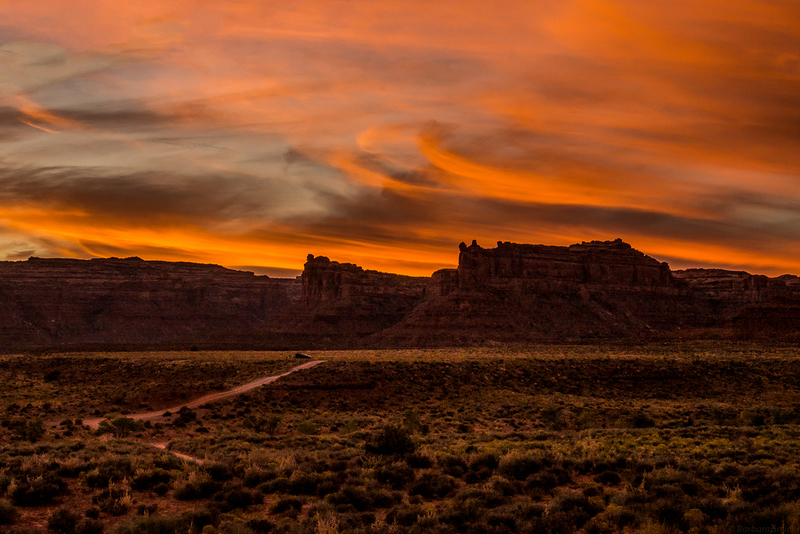 My friend Joe said we barely touched the length and breadth of the Valley of the Gods, but we ran out of daylight. During this trip, the condition of the mountains and monuments constantly struck me as “Quick, come see them before they all fall down!” Yet, they’ve looked like this for thousands? – millions? of years. Look out below . . . 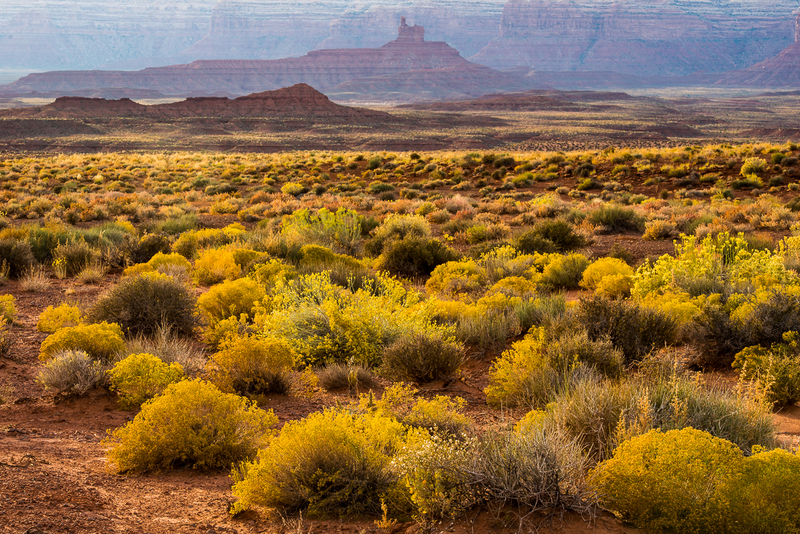 The plants were beautiful in the evening light; the whole valley was glowing. You can see how the ridges in the back of the photo were sprinkled with the golden light also. At least if the snakes were out, you could see them between the plants. The rivulets in the middle back of the photo tells me of the sea that started washing all the sand away making these beautiful formations. Wind finished the job after the sea receded. If you click on the photo, it will get larger and you can see the wave marks going down the mountain. Awesome is the word to use here. Sometimes the word is used for mundane, everyday occurrences; this is one example of it being the right word. The whole sky was colored. I kept turning around and around, not wanting to leave the light. When we finally pulled out, it was dark. There is a truck parked near the road in the middle of the photo that helps to give scale to the photo.